Somewhat overshadowed by it brother, the Lakes course is equally, if not more outstanding then the Canyon. Thsi course has recently undergone som major renovations and it'll be interesting to see the changes. The Par 4 18th is one of those holes where you could play it over and over again and not get bored. Carts are allowed (they're not on the Canyon) and it's a little more relaxing, yet just as demanding. 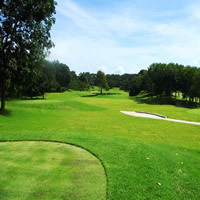 If you're in Phuket, you MUST play both these courses to see why it wins awards.